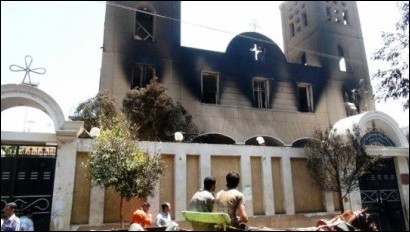 One of dozens of churches attacked in recent years in Egypt. A man hurled an improvised bomb at the entrance of a packed church in Egypt in what observers say could've been a repeat of the Two Saints Church attack in Alexandria, 2011, which left 23 dead, and 100 injured. The bomb was dismantled before exploding. The attack occurred during the late hours of Saturday, November 12. Thousands of Coptic Christian worshippers had assembled for a church celebration inside the St. George Church in Samalout, al-Minya province. One Christian near the entrance saw an unknown man drive up on a motorbike, hurl the bomb at the church, before quickly riding away. Security agents were instantly contacted, even as one young Coptic man grabbed the bomb and rushed it away from the church's premises. The congregation fled out of the church in what was described as a "tense" and "terrifying" night. The bomb squad arrived quickly and managed to dismantle the bomb before it detonated. The St. George Church has stood for more than one hundred years in Samalout. Although the total church property is 1200 square meters, the church building is only 300 square meters. In an effort to accommodate Samalout's thousands of Christians, church leaders have for seven years attempted to enlarge the church on its own property, as well as build a fence for protection, but authorities refuse to allow them.